Starring Bugs Bunny, Elmer Fudd, Daffy Duck, Porky Pig, Tweety, and Sylvester. 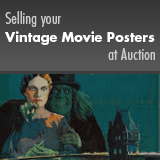 An unrestored poster that has an overall presentable appearance. May show some signs of age, including brittleness, staining, slight fading, pinholes, edge or fold wear, fold separations, or paper loss. Archival tape on verso. Please see full-color, enlargeable image below for more details. Folded, Very Good/Fine.